From extreme heatwaves to severe flooding, travelling in Australia can require grey nomads and others to cope with challenging – and sometimes dangerous – conditions. A group of campers at the Hervey Range in far north Queensland managed to keep their heads after they found themselves in the terrifying position of being cut off by flood waters from Keelbottom Creek. After being trapped for eight hours, the group raised the alarm on Tuesday afternoon and a search and rescue operation was launched immediately. 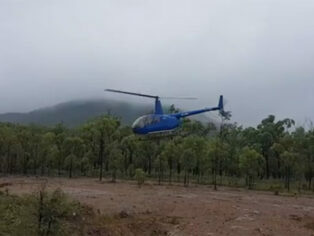 The two men and two women, aged between 26 and 31, were eventually winched to safety by helicopter. Rescue helicopters had initially been unable to reach the campers so a smaller mustering helicopter was called in from Charters Towers to winch them from Table Top Station. All four campers were unhurt. Inspector Crosby said that, with the benefit of hindsight and maybe local knowledge, it probably wasn’t the best time for the group to go camping. The Bureau of Meteorology has continued to warn moderate to major flooding was possible later this week as the monsoon trough extended across north Queensland. Have you ever found yourself caught out by fast-rising floodwaters? Comment below. Back in the 80`s, marooned for 3 days in a couple of places on the Kennedy Development Rd, between Winton and Boulia. There were many tourists, a couple of coaches and a few road trains. Needless to say, food was short, as many were not prepared for outback travel. Some of the road trains had vegetables on board, so food was given to those that needed it. We ended up on an island, impassible behind and infront, due to flooded creeks. At this point a couple of us comandeered a canoe from a tourist and paddled across the river to the Middleton Hotel to get a sheep to feed the hordes! The next day I was the first car through, much to the amazement of the people on the Hotel side of the creek. Back then it was common sense and the old Army method of wading and fording which got people through. I had plenty of practice and training driving in floods, as it was an every day event in the wet season just to get to work. No common sense or training these days, so its easier -if its flooded forget it!